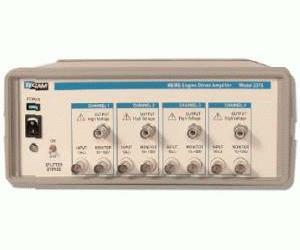 The Model 2375 Four-Channel MEMS Engine Driver Amplifier has two modes of operation: normal (splitter bypass) mode and splitter mode. Each of its four channels is rated for 20 mA continuous current with 0.2 output impedance. The 2375 can drive capacitive loads up to 200 pF while maintaining a full power bandwidth, exceeding 5 kHz. The outputs are short circuit protected. Each channel has an independent voltage monitor output for applications that require a low level representation of the output signal in a closed loop system. The buffers produce a reduction of 100:1 of the output voltage for measurement devices with a 1 M or higher input impedance.